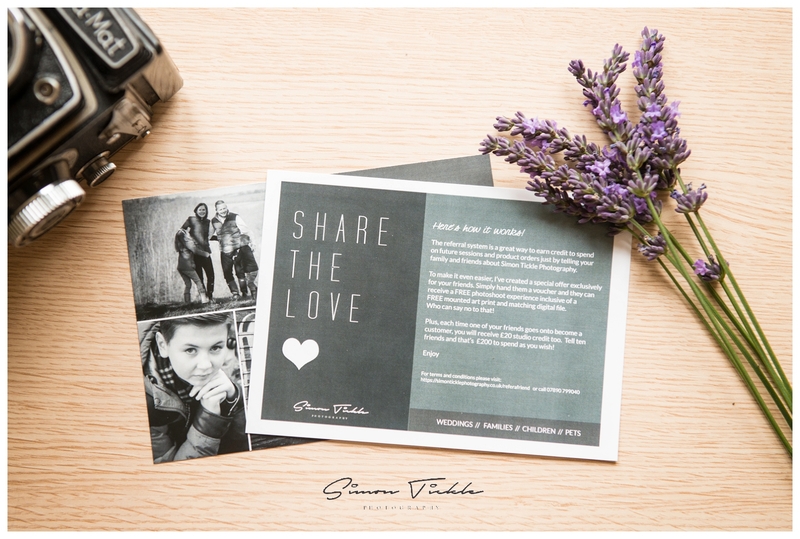 The referral system is a great way to earn credit to spend on future sessions and product orders just by telling your family and friends about Simon Tickle Photography. To make it even easier, I’ve created a special offer exclusively for your friends. During your viewing session i’ll provide you with a series of beautifully designed gift vouchers – simply hand these to your friends and they can receive a FREE photoshoot experience inclusive of a FREE mounted art print and matching digital file. Who can say no to that! Plus, each time one of your friends goes onto become a customer, you will receive £20 studio credit too. Tell ten friends and that’s £200 to spend as you wish! Vouchers have no cash value and cannot be exchanged for cash. Vouchers are only valid for first time customers. Maximum of £200 studio credit can be accrued by a single customer. Studio credit can be redeemed against any portrait session fee or product but not against wedding photography services. Studio credit cannot be used in conjunction with any other special offer. Credit cannot be used retrospectively against orders that have already been placed. Simon Tickle Photography reserves the right to withdraw this promotion at any time.